Customer attention span is getting shorter every day! Would you believe the average attention span of a customer is less than of a Goldfish’s which is 9 seconds? With an average customer getting more than 10,000 messages from different brands every day, does your business really stand a chance? May be.. No??? Noise is getting louder guys!!! Your customer wakes up with his Samsung Phone Alarm. He puts it to off and wears his comfy Bata slippers. He puts his Colgate toothpaste on his Oral B toothbrush and starts brushing teeth. Next, he squeezes out the Himalaya Body Wash, shaves with Nivea shaving cream and Gillette razor. Also, uses L’Oreal shampoo and conditioner to wash his hairs. Once done, he applies Axe deodorant and fixes his hair with Garnier Fructis Hair gel, also uses Dove body lotion on the body. Now puts on his Monte Carlo shirt with John Players Jeans, complementing it with a stylish Titan Watch and A woodland Shoes! So guys, your customer has not even left the house and he has encountered more number of brands than you and I can imagine. So in this ever increasing noise, how are you getting your brand heard? 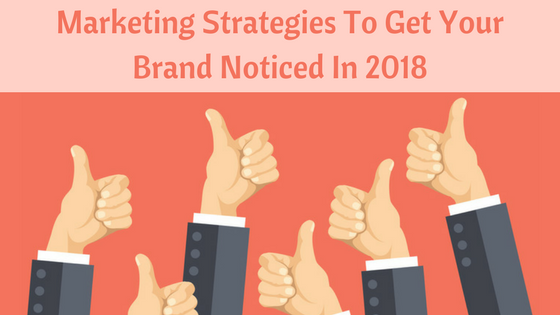 This article is going to share some smart ways you can make your brand heard in 2018. Let’s get started guys! For any company’s visual identity, Logo is the first factor that strikes in mind. So while you are working towards getting your brand more exposure, the first thing you need to check is the Logo. Check whether it resonates with your business name or not. If not, you need to start redesigning now guys. The next thing to analyse is the color. Surface level study for the colors is going to help you in long run. Now, I understand, that everyone has its own color choices but there are certain association, we all make when it comes to colors. Being aware of these associations can help you design a logo that strikes the right chords among your customers. For eg, if you talk about McDonald's, its logo color is the combination of Red and Yellow. On the other hand, Yahoo’s is of Purple and Coca Cola logo shows Red. One can easily differentiate Facebook and Twitter just by looking their logo color, right? Once you are done with the colors, here comes the major part- designing! So no worries if you don’t have a professional designer by your side, look for Free or Cheap Online Logo Maker tools like Canva. Honestly, design schools are very easier to access and better too. But no matter which tool you choose, always keep the latest design trends in mind. For eg, flat designs are in right now, so unless you have some perfect idea in mind, don’t go to the opposite direction. Your website design is the extension of your website logo. All the analysis you have done in terms of font, color, shape regarding to logo is going to play an important role in web design as well. But along with that, what matters more is the usability. The easiness of use is what impresses search engines and your customers more than ever. Make sure to pass the ultra modern or cutting-edge design if you are not a famous brand right now. Now many of you might think that if you are avoiding these styles, how will you stand out? Well, guys, simply take time to build a lightweight beautiful website that can provide your customers a smooth experience and make them stick around. A website doesn’t have to look complicated to look stunning! Look at Medium and you will know. Also provide informational high quality content with neater design. Again, if you are a newbie here, don’t hesitate from taking professional help. 75% of marketers today are trying their hands in influencer marketing, making it one of the most effective ways to get your brand noticed on www. The basic concept behind influencer marketing is to connect with the influential people in the same niche and get them spread the word about you. These influencer when talk about you, build credibility for your brand. Social media posts, blog reviews, endorsements, etc are some of the forms of influential marketing, So if you are also planning for influential marketing, keep a story-to-tell ready and find a strategy that works for your brand and the influencer. Guys, blogging is not dead, not even close! Regular well strategized blogging not only creates brand awareness but also brings potential customers who might become your loyal customers. The point here is that content marketing must be the solid base of your branding strategy. Content marketing is what tells who you are and why you are here. So start your company blog and above all, and don’t forget to keep it updated. Share useful information about your business, product and market. Also try to add humor element sometimes. Don’t make the mistake of starting a blog and then leaving it for months or even years. Imagine someone finds your blog and see that the last post you published was 6 months ago, not a nice scenario, right? They might assume you are not in business anymore, and there my friend, you lost a potential customer! Email marketing is one of the best ways to get in front of your customers on a daily basis. So while you want to get your brand heard in this extremely noise world wide web, email marketing is your best bet. The approach not only helps you deliver the content your customers want, but also builds a platform to nurture long term relationships. Very old school yet highly effective, a must try approach if you want to give your brand the exposure. Guys, branding is what makes you sustain which is why if you are not doing it right, think again! Follow above mentioned strategies to bring your branding journey on track. Most Popular Company Slogans: Know How You Can Write Yours! How To Get Influential Customer Testimonials (Examples inside) !